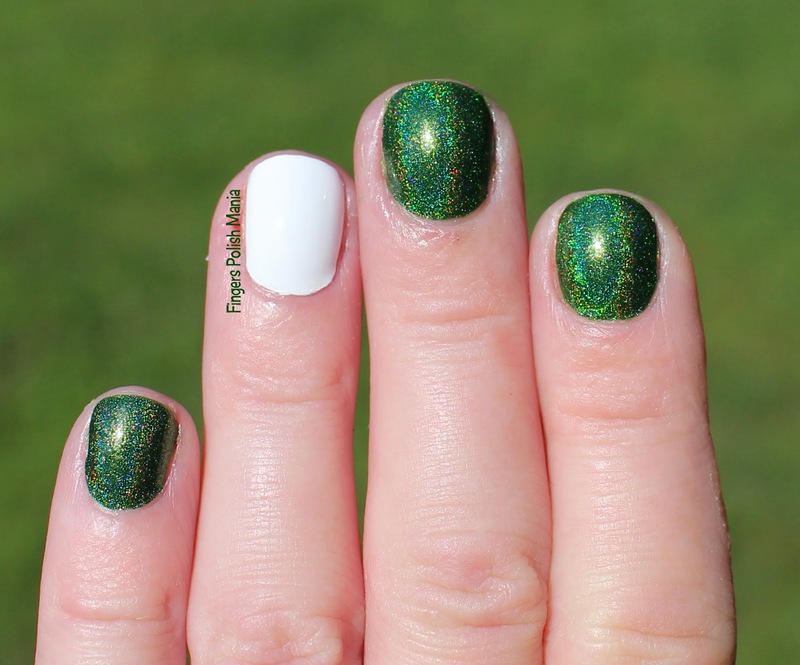 fingers polish mania: Made for me holo and my niece's nails! Those of you who actually read and pay attention to my drivel, will remember that when I come home for vacation, I always do my niece's nails. Today's post will feature one that I did while there. But first, we went to have lunch with her at the school I went to and haven't been back to in 18 years. Let me tell you it was freaky to be sitting in the cafeteria with a bunch of third graders. They have totally remodeled the school so it wasn't the same as when I was there, but still flashback central for me. One of the girls next to me was talking about how she has a boyfriend and I'm thinking you're in third grade! At the end of the lunch half hour, a boy came up and just stood next to my niece and they both looked at each other and blushed and had these grins on their face. It was so cute-I think they have a crush on each other. I was happy that the lunch was only 30 minutes. I had had enough! The noise that was generated wasn't helping my migraine any! We then went across the street to the bead store and I bought 5 more beads for my Pandora like bracelet. I have about 8 more to go before the bracelet is complete. If any one wants to see my new beads, let me know! Now because I did my niece's nails, I didn't do a bottle shot. Plus, as I'm writing this, I think I am coming down with my mom's cold that she's had since Canada. I am feeling feverish and my throat hurts and I just feel blah. Not a good thing as my vacation comes to an end. You wait all year for your vacation and it then goes by in a flash. I have today and tomorrow here then the long drive back home. I hate leaving as I know I won't be back for another long year. 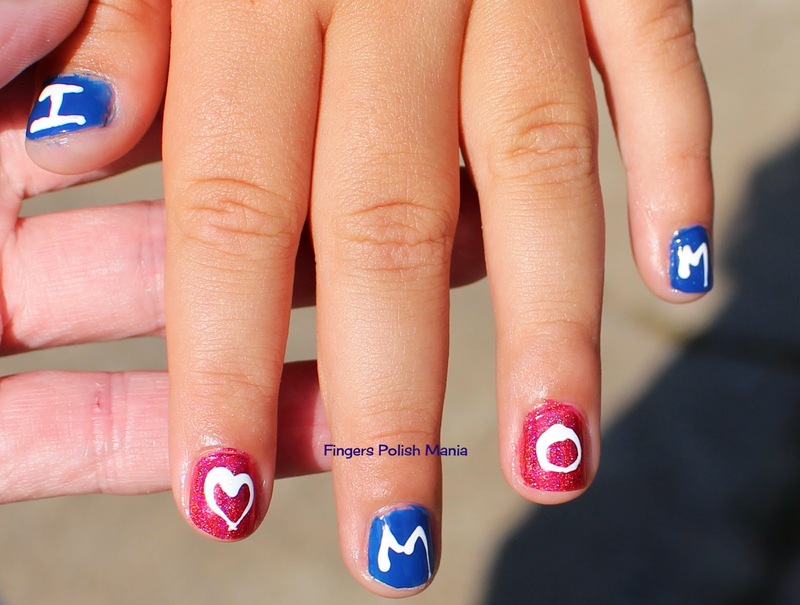 My brother's birthday was yesterday so my niece wanted to do something special and since we are a NY Giants family, we used the team colors for her mani. Here is what she picked out for me to do. The polish I used was Bettina Cobalt and a made for me holo by More Nail Polish called "My favorite color is holo". I used acrylic paint for the letters. Can you see what it says? I heart Dad and I heart Mom. I thought that was pretty nice. After I write this, I will be doing her nails again. For me, I started with another made for me holo called "He Said What?" based on my online dating stories. I also used OPI Alpine Snow. 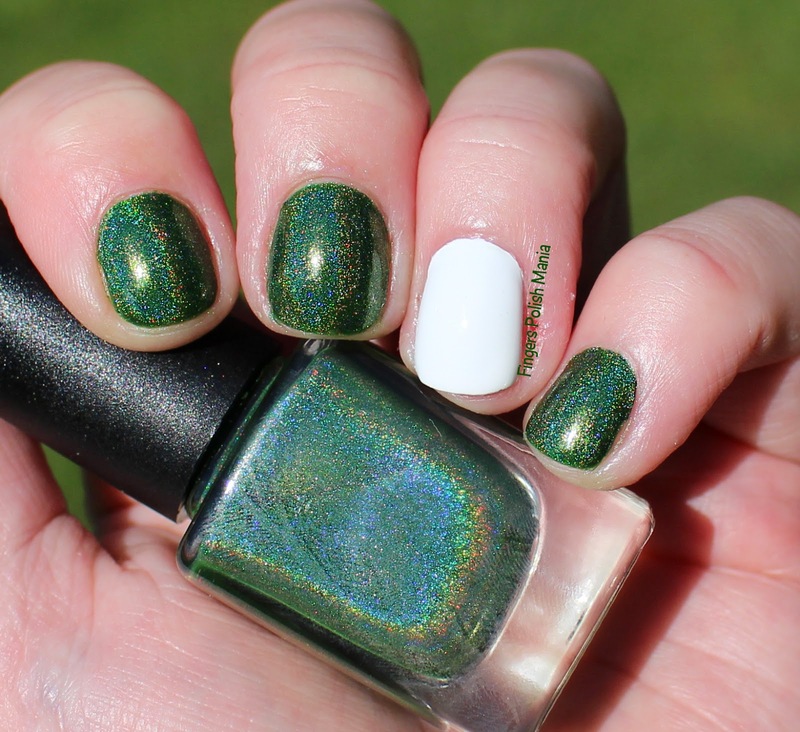 How glorious is this forest green holo?????? 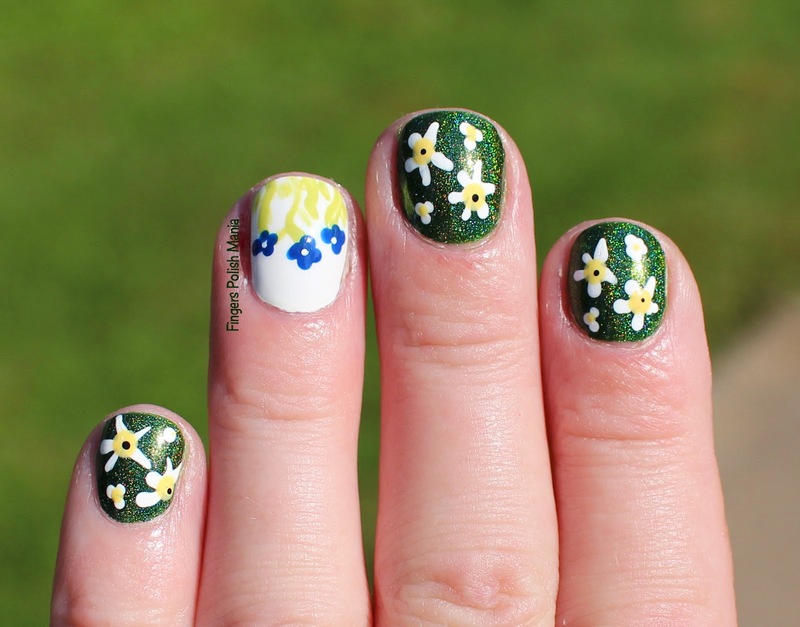 Ignore the nubs and the fishing casualties on my skin and just focus on the greenness! Next I simply did dot flowers that aren't my best work, but I'm on vacation! Like I said, not my best work-but it is what it is! 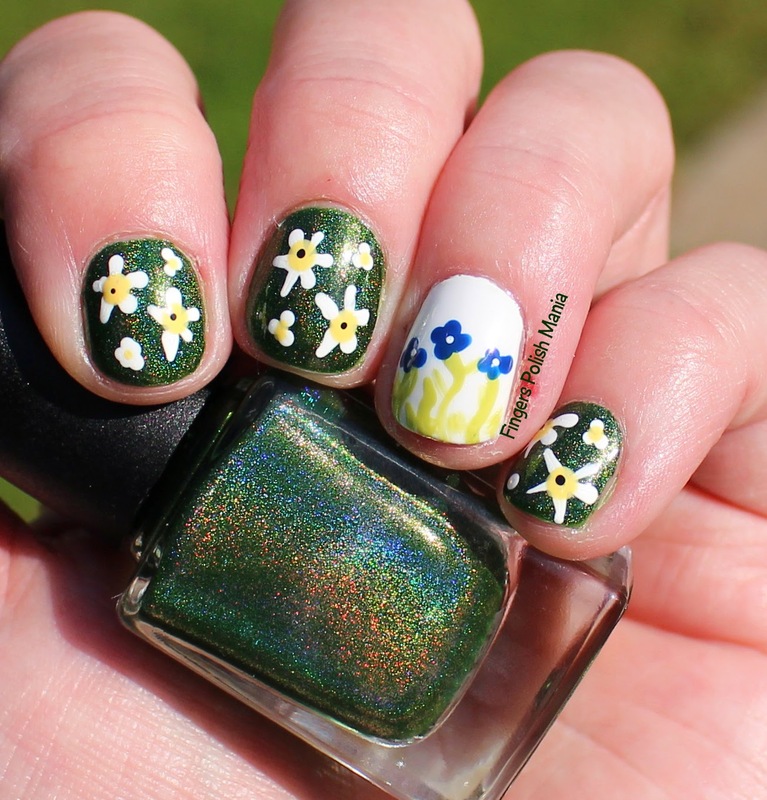 I am simply enamored with this green-I doubt I have anything like it in my holo stash! Plus it was made just for me. The best present ever! Stay tuned for another post with my niece's nails. I've got to go do them now!